Laura Iwasaki and her family are paying what may be their last visit to Laura's grandfather's grave. The grave is at Manzanar, where thousands of Americans of Japanese heritage were interned during World War II. Among those rounded up and taken to the internment camp were Laura's father, then a small boy, and his parents. Now Laura says goodbye to Grandfather in her own special way, with a gesture that crosses generational lines and bears witness to the patriotism that survived a shameful episode in America's history. 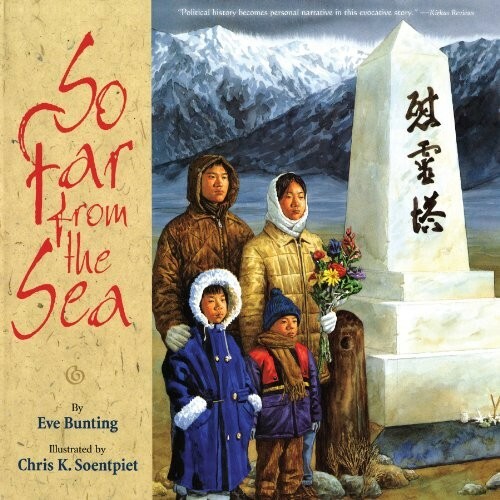 Eve Bunting's poignant text and Chris K. Soentpiet's detailed, evocative paintings make the story of this family's visit to Manzanar, and of the memories stirred by the experience, one that will linger in readers' minds and hearts.